Of course, no one ever enters a medical facility expecting to get sicker. Unfortunately, thousands of people who enter nursing homes and hospitals every year for medical treatment or rehabilitative care wind up developing a complication that is more painful and enduring than they ever could have imagined — the development of a pressure ulcer. Pressure ulcers are wounds that frequently develop on bony areas of the body where there is little tissue to distribute the pressure from the surface that they are sitting or laying on over extended periods. For this reason, the most common areas of the body where pressure ulcers develop are: hips, elbows, heels and the area of the lower back known as the coccyx. The medical community has embraced a staging system to grade pressure ulcers as they progress. The four stage scaling system uses identifiable characteristics present in various types of wounds to help professionals in the treatment of the pressure ulcers as well. 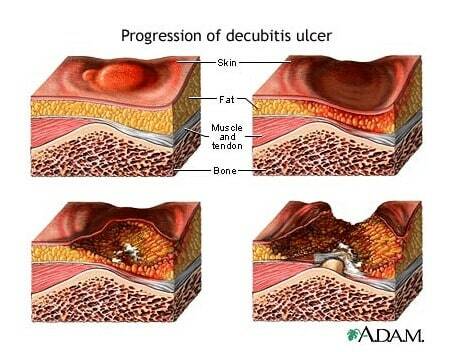 Stage I Pressure Ulcer: Intact skin with non-blanchable redness of a localized area usually over a bony prominence. Darkly pigmented skin may not have visible blanching; its color may differ from the surrounding area. The area may be painful, firm, soft, warmer or cooler as compared to adjacent tissue. Stage I may be difficult to detect in individuals with dark skin tones. May indicate “at risk” persons (a heralding sign of risk). Stage II Pressure Ulcer: Partial thickness loss of dermis presenting as a shallow open ulcer with a red pink wound bed, without slough. May also present as an intact or open/ruptured serum-filled blister. Presents as a shiny or dry shallow ulcer without slough or bruising. This stage should not be used to describe skin tears, tape burns, perineal dermatitis, maceration or excoriation. Stage III Pressure Ulcer: Full thickness tissue loss. Subcutaneous fat may be visible but bone, tendon or muscle are not exposed. Slough may be present but does not obscure the depth of tissue loss. May include undermining and tunneling. The depth of a stage III pressure ulcer varies by anatomical location. The bridge of the nose, ear, occiput and malleolus do not have subcutaneous tissue and stage III ulcers can be shallow. In contrast, areas of significant adiposity can develop extremely deep stage III pressure ulcers. Bone/tendon is not visible or directly palpable. Stage IV Pressure Ulcer: Full thickness tissue loss with exposed bone, tendon or muscle. Slough or eschar may be present on some parts of the wound bed. Often include undermining and tunneling. The depth of a stage IV pressure ulcer varies by anatomical location. The bridge of the nose, ear, occiput and malleolus do not have subcutaneous tissue and these ulcers can be shallow. Stage IV ulcers can extend into muscle and/or supporting structures (e.g., fascia, tendon or joint capsule) making osteomyelitis possible. Exposed bone/tendon is visible or directly palpable. Unstageable Pressure Ulcer: Full thickness tissue loss in which the base of the ulcer is covered by slough (yellow, tan, gray, green or brown) and/or eschar (tan, brown or black) in the wound bed. Until enough slough and/or eschar is removed to expose the base of the wound, the true depth, and therefore stage, cannot be determined. Stable (dry, adherent, intact without erythema or fluctuance) eschar on the heels serves as “the body’s natural (biological) cover” and should not be removed. Given the severity of pressure ulcer progression and ensuing complications, it is imperative that staff at medical facilities identify and begin a course of treatment as soon as there is evidence of a pressure ulcer in order to avoid the dibilitiating complications that typically accompany this condition.